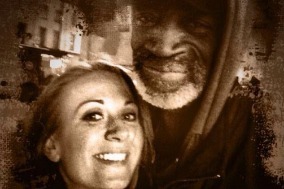 Jenny Baker met Michael, a homeless man, on Saturday night. They got talking and Michael told her he was originally from Jamaica and was desperate to return home. So Baker raised enough money to get him there - in a day. Baker set up a fundraising page on a crowdfunding website on Sunday explaining why she was raising the money. She said she met Michael in Dalston the previous night. He was 64 and had come to the UK with his mum. She wrote: "Unfortunately his mother passed away and he found himself homeless with no funds. He told me that all he wants more than anything in the world is to go back to Jamaica where he says he will be fine and happy again. I have promised this man that this time next year he will be back in Jamaica and that I will make it my personal mission to make it happen." The communications professional used the Twitter hashtag #getmichaelhome, and within three hours she had raised £600. She used her professional skills to pick up some media coverage and within six hours had raised £1,400. Within 24-hours she had passed her £3,000 target and raised £4,000 - from 450 people. Last night she went back into Dalston and found him to share the good news. This morning she tweeted: "Need to speak to the embassy 4 advice & then hopefully he'll be on a plane home in no time. He has family there so said he can stay with them." She is also working on getting him somewhere to stay until he goes. Meanwhile the total keeps rising and by midday on Tuesday she had raised more than £7,300 from almost 850 people. She says the extra funds will be used to set him up when he gets home. Baker has done an amazing job to tap into the incredible way that crowdfunding is being used to help people. Sites such as gofundme and giveforward have raised hundreds of millions of pounds for people around the world. After the Boston Marathon bombings, friends of the victims set up sites to raise money to pay their medical bills. Victims included Jeff Bauman, whose photograph had featured in a number of newspapers after his legs were severed by the blast. One man who helped him on the day set up a site to try to raise $500 to help him. He hit that target within half an hour, and raised more than $250,000. In total, victims of the bombings received more than $2 million through crowdfunding sites. And it's not just major huge tragedies that attract funding - there are a number of incredible stories of personal fundraising too. Dillon Vado, a college student who was paying his way through college in California by drumming had his drums stolen from his car. His dad launched a crowdfunding page and raised $6,000 - including $2,000 from one anonymous and incredibly generous donor. Meanwhile a family in Maine was hit with tragedy. While battling cancer, heart problems, and business failure, their home burned down. A friend of the family set up a gofundme site to try to raise $5,000 to help the family. To date they have raised almost $12,000. And when a father passed away in a small town in Massachusetts last week, friends and colleagues set up a crowdfunding page to raise money to help his widow and 9-year-old daughter. The site was set up on 7 February, and within four days had surpassed the goal of raising $10,000 and hit almost $32,000.